At the beginning of the new decade, Sabbath underwent what could be called a total makeover. Gone was the muddy, uncertain sound a of their earlier albums, to be replaced by Martin Birch’s state-of-the-art, crystal-clear production, which allowed every instrument to shine – not just Geezer Butler’s and Bill Ward’s thunderous rhythm section or Tony Iommi’s legendary riffing, but especially new guy Ronnie James Dio’s awe-inspiring roar. The latter’s addition made the real difference in the band’s performance: though Ozzy’s distinctive, eerie wail had been Black Sabbath’s trademark since the beginning of their career, Dio (who had left Ritchie Blackmore’s Rainbow to join the band) was something else completely. Such changes obviously altered the band’s sound in a rather substantial way, so that Heaven and Hell sounds quite unlike their Seventies output – less chillingly menacing, more crushingly powerful, yet also more accessible. The hard-driving “Neon Knights” (one of the strongest opening tracks ever) sounds like a statement of intent right from the start, brimming with Iommi’s towering guitar riffs and Dio’s soaring bellow. Things slow down for the following number, the epic, doom-laden “Children of the Sea” – one of Dio’s career-defining vocal performances together with Rainbow’s “Stargazer”. On the other hand, “Lady Evil” is a catchy, uptempo song, punctuated by Butler’s booming, dynamic bass lines, which provides a respite of sorts before the monumental title-track – strategically placed at the end of Side A when the album was originally released. A concert classic for both Dio-era Black Sabbath and its unfortunately short-lived, eponymous band, “Heaven and Hell” is a crushingly heavy cavalcade bolstered by Butler’s thundering bass and Iommi’s manic riffing, with Dio’s voice soaring and swooping above the din in true epic style. As a sort of release of tension, another catchy tune follows, the almost poppy “Wishing Well” (no relation to the Free song of the same title). “Die Young” can instead be counted as another of the album’s highlights – a powerful, keyboard-laden hard rocker, it sees another cracking vocal performance from Dio, enhanced by Iommi’s sterling guitar work. While the slightly nondescript “Walk Away” is, in my view, the only track that approaches filler status, the album is wrapped up by another memorable number. “Lonely Is the Word” most closely resembles Sabbath’s earlier output with Ozzy – a sinister slice of doom driven by Iommi’s iconic riffing, while Dio’s vocals sound pleading and commanding in turn. The wistful yet intense guitar solo at the end of the song is undoubtedly one of Iommi’s finest moments. 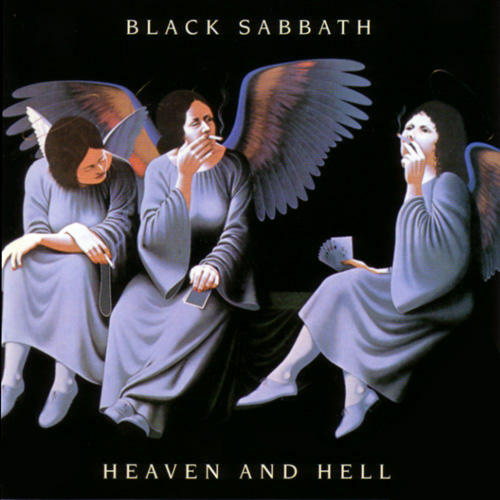 Originally released on April 25, 1980, Heaven and Hell is still revered by rock fans, even though the younger generations of metal fans may find it somewhat lightweight if compared with the output of the countless extreme metal acts flooding the current scene. While it does contain occasional progressive touches, it was never as influential to the development of prog-metal as Black Sabbath’s Ozzy-era offerings. The presence of a few catchy tunes might also put off some purists, who might find the likes of “Lady Evil” o “Wishing Well” too close to AOR for comfort. All this criticism notwithstanding, Heaven and Hell is one of the milestone releases of the past 40 years, and one of the greatest vocal albums in the history of rock. As well as being a celebration of the album’s 31st anniversary, this review is meant as a homage to Ronnie James Dio, who passed away almost a year ago, on May 16, 2010. Together with Rainbow’s Rising, this album was possibly Ronnie’s finest hour.